The Similan Islands diving season is now set to start October 15th, although many boats will not start until November. 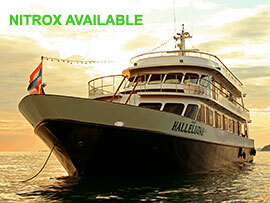 Time to get your plans made for a liveaboard this coming season, and the Hallelujah is a great choice. One of the top "mid price" boats, Hallujah is a very big, comfortable dive boat, very well run and will be one of our top sellers for this season. Despite the name it's not a religious boat .. everyone is welcome! For the next season, you can book any trip on Hallelujah with a 10% discount if booking and paying in full before October 31st!